The Crusader Mk III is a Rank I British light tank with a battle rating of 2.7 (AB/RB/SB). 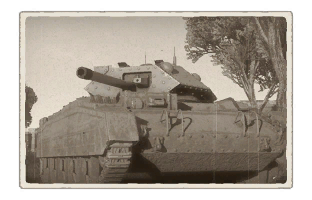 It was introduced along with the initial British tree line in Update 1.55 "Royal Armour". Interior 14.27 mm side armour is made of structural steel. Ammo racks of the Crusader Mk III. A Crusader MkIII heading to combat on Poland. The Crusader tank was designed to be fast and highly mobile, exploiting enemy battle lines by penetrating the flanks and disrupting the enemy from behind. In the game, the Crusader should be used in a similar fashion. It is quick, well armed and highly manoeuvrable, making it great at rushing capture points and exploiting the enemies flanks. The 57mm gun is excellent for its tier, with high penetration and good ballistics. 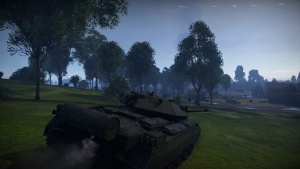 Very few tanks can withstand a hit from this gun without major damage or worse. The tanks low profile is its main advantage. You can hide easily among vegetation and obstacles like walls, shooting from a concealed position or retreating if the situation is looking a little too dangerous. Of course, you can't have everything. The tank has thin armour, so it isn't suitable as a front line tank. The armour is sloped, however, so you may bounce some smaller calibre shells. Explosive shells are your worst nightmare, so avoid getting hit by them. The 57 mm gun has great penetration, but the Crusader has very thin armour. There are still plenty of enemies that can give you some trouble. T-34 (1940)- You will begin encountering early models of T34s at this tier. You can penetrate their turret easily and drivers port easily, but they can pose a serious problem when angled properly. Also, the 76mm L11 gun can easily take you out with its massive explosive power. 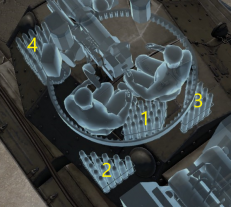 Try to take out the gunner first and then deal with the rest of the crew members for a safe kill. Panzer IV F1- The rapid-fire 75mm short barreled gun can fire HEAT or APCBC rounds, which can penetrate and cause serious damage to the Crusader. Luckily, the F1 has flat armour which can be easily penetrated from the front. Range is your friend with these tanks. Their gun is very difficult to aim accurately over 500m. Hit it before it hits you and you will most likely come out on top. KV1-L11 - These heavy tanks are rare at your battle rating, but can still be faced. They have great, bouncy armour and a deadly gun. Try to hit the turret cheeks or the side/rear armour. Pz.Kpfw. III Ausf. L - This Panzer III has a great, high-velocity gun and excellent frontal armour. The extra 20mm high hardness plates make a massive difference to the frontal armour, making it more bouncy and harder to penetrate. Fortunately, your gun can reliably penetrate the Panzer III L. If you are unsure, aim for the drivers port to kill the driver, gunner and commander. Almost every tank can kill you easily, even with Rank I guns. Stay mobile, take advantage of the tanks low profile and shoot only when you know you can penetrate. This can make you a formidable tank on the battlefield. In 1938, the General Staff of the British Army requested for a cruiser tank that was lighter and more affordable than the heavier A16 cruiser design developed by Nuffield Mechanizations & Aero. One of these designs was the designation Tank, Cruiser Mk.V based off the A13 cruiser tanks, named the "Covenanter", and Nuffield was invited to become part of its development team, but they refused due to interest in developing their own cruiser tank. Their tank was designated the Tank, Cruiser Mk.VI Crusader and fell under the General Staff specification of A15. The Crusader was a parallel design to the Covenanter but was ready six weeks earlier than the Covenanter despite starting at a later time. The Crusader was adopted into service with the British Army in 1941 and the 5,300 units were manufactured between 1940 to 1943. 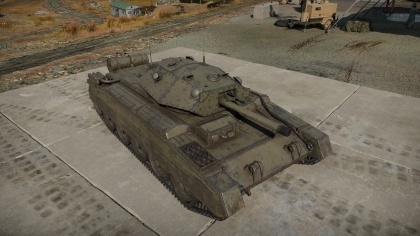 The Crusader features a new design that differs from its cruiser tank predecessors. The Christie suspension system on the Crusader had five road wheels for it instead of the usual four, which improves weight distribution of the increased 20-ton weight of the Crusader compared to the 14 tons of the A13 cruisers. The engine, steering system, and cooling system on the Crusader was different as well, but the Covenanter and Crusader use the same main turret. The polygonal shape of the turret gives the crew inside more room for the turret ring diameter. The Crusader Mk.I and Mk.II were equipped with the 2-pounder, which was aimed by the gunner inside with a padded shaft that allows them to elevate the gun by simply adjusting his own height. Later in the war where an up-gun of the tank armament was necessary and newer tanks such as the Cromwell was delayed, the Crusader was upgraded into the Crusader Mk III variant with a 6-pounder instead, which restricted turret space, requiring the turret crew to be reduced from three to two. These first saw action in the Second Battle of El Alamein in October 1942. The Crusader first saw action at North Africa, right after the British had been pushed back to the Egyptian border by Axis forces. The Crusaders were part of the huge shipment in the Malta Convoys to reequip the British forces there. Enough Crusaders arrive that the entire 6th Royal Tank Regiment was refitted with them, which joined up with the 2nd Royal Tank Regiment to form the 7th Armoured Brigade "Desert Rats". The brigade's first action was in Operation Battleaxe, though it was delayed due to adapting the tanks for the desert environment. The operation, which called for the relieve of the siege of Tobruk in June, was initiated in June to which 11 Crusader tanks were lost to anti-tank guns, plus many more to mechanical faults. While more Crusader tanks came in to reinforce the cruiser tank forces, there were never enough to supply the continuously expanding armoured units as 7th Brigade was combined with the 7th Hussars, the 2nd Armoured Brigade was added to the 7th Armoured Division, and the 8th Hussars was combined with the 4th Armoured Brigade. Overall, the Crusaders proved effective in the North African Campaign, the Crusader was faster than any tanks on the opposing side and the 2-pounder was lethal to the Panzer III, but the tank suffered from its thin armour, mechanical problems in the desert, and the growing deficiency of the 2-pounder, which didn't have enough range to destroy farther tanks. The Crusader design also caused the ammo racks on the tank to easily ignite due to unprotected racks and shot traps on the turret design. Anti-tank guns continue to be the main reason the Crusader units suffer losses, rather than to enemy tanks. By the end of 1941, only the 2nd Armoured Brigade retained the Crusaders, the rest of the other tank units were being refitted with better tanks, such as the M3 Grant medium tank from the American Lend-Lease. Crusader units were also refitted with the more powerful Crusader Mk.III with the 6-pounder, which improved the Crusader's ability to destroy the gradually stronger German tanks. After General Bernard Montgomery took command of the British Army in 1942, more British tank units were re-equipped with the Grant and M4 Sherman tanks while the Crusaders were relegated from the front-lines to "light squadrons" meant to flank the enemy and attacked at its exposed sides. When the British 1st Army engaged the Axis at Tunisia, some tank regiments still use Crusaders mixed in with Valentine tanks. These units in the 26th Armoured Brigade, code-named "Blade Force", worked alongside the 78th Infantry Division as an independent armoured column. During Tunisia, the 1st Army was already converting the tank regiments into Shermans, but the 8th Army continued to use the Crusaders for much longer, which would see use at the Battle of Wadi Akarit and Mareth Line. After the North African Campaign, the Crusaders no longer saw any use in the front-lines and were used in other roles such as gun tractors with 17-pounders or anti-aircraft mounts such as the Crusader AA Mk.I and Mk.II. Some Crusader tanks equipped the tank regiments that stayed back at the British Homelands such as the 11th Armoured Division.